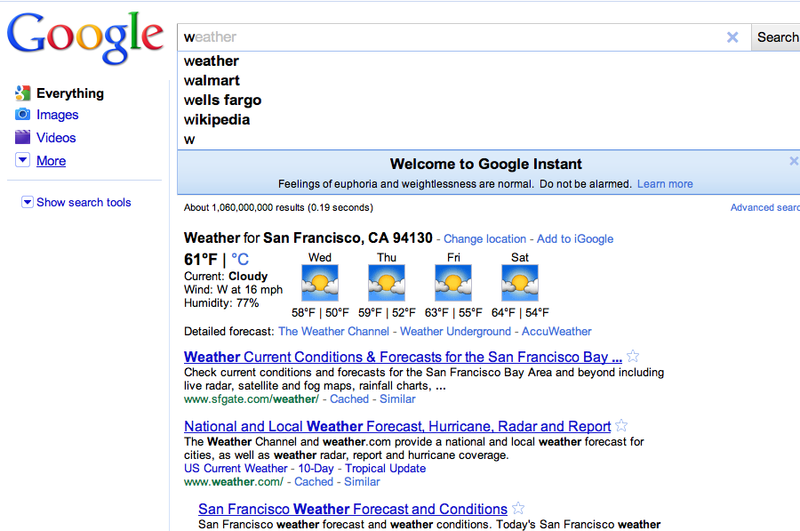 Google (s GOOG) launched today a revision of its core search technology called Google Instant. Instant turns search into an application; on a single page it combines the traditional process of entering a query into a box, hitting return, and landing on a new page populated with search results. Instant acts and feels like a mobile app, and in my opinion would make more sense if it was one. Instead, it was launched as an tweak to Google’s web site. The goal of Instant to make search faster by interpreting and displaying what searchers are likely to want on a character-by-character basis before they even finish typing a query. Google estimates the process saves 2-5 seconds per search. The company said at a launch event in San Francisco today it plans to roll out Instant to all users globally soon, starting on the web and moving to other platforms like mobile and browser toolbars. Google is treating Instant as a major launch, not an opt-in beta like many of its other new products. Instant is a web site, but in many ways it acts more like a mobile application you’d find on your iPhone (s AAPL) or Android handset. Personalization. Each version of a mobile app knows who its main user is — whether it’s to remember your high score, keep you logged into to your social network, or hold your place in an article. On Instant, when you start typing to ask Google a question, it will not only show results for what other users are likely to be looking for, but what it thinks you personally are likely to be looking for. Context. Mobile apps make use of information about your location and state from GPS and other cues. Instant also uses your location within the nearest metro area based on your IP address. Soon, the feature will also include a user’s web history (this was included in tests, but removed for the launch because it wasn’t ready yet, said a spokesperson). All-in-one. Instant runs in AJAX on a web page, so the user never has to wait for a new page to load. This is in alignment with Google’s preference for HTML5 apps over native ones specific to one of many competing operating systems. Still, there are downsides to apps; they are sort of like the web with training wheels. Some of us would rather explore further and more freely than an app permits. Instant could reduce serendipitous discoveries of barely known web sites that don’t ever make it to the top search result. As Instant spreads to the browser, it will give Google even more centralized control over how we experience the web. The ascendancy of the app mentality is, of course, directly correlated to the rise of smartphones. On a mobile device, time is of the essence, and every character is an opportunity for a fat-fingered typo. With its speed and algorithmic intuition, Instant would obviously be an exceptionally useful tool on a phone (and a tablet, too!). Google’s Marissa Mayer said the company expects to launch Instant for mobile in the fall. The problem is, mobile networks aren’t really ready for Instant. After the launch presentation at the SFMOMA today, Google product managers showed off demos of Instant on computers as well as a Droid 2. The employee demoing Instant said it was recommended for use on Wi-Fi; it would work pretty well on 3G; and not really at all on EDGE. That’s because Instant is incredibly demanding; the AJAX interface requires constant communication with Google’s servers to autocomplete results on a letter-by-letter basis without refreshing the page. This is a mobile app before its time. Is Google.com a Dying Platform? It seems toolbar search isn’t just an early adopter behavior; much of Google’s search traffic doesn’t come through its homepage these days. After Google declined to provide its own stats, I asked a bunch of measurement firms for their breakdowns of where Google searches originate. So far, the ad network Chitika got back to me to say that in an analysis of its traffic today (which is primarily in the U.S. and Canada), just 18 percent of Google’s traffic came from its home page. Chitika research director Dan Ruby told us he believes the majority of Google traffic comes from browser toolbars, and recently estimated that 9 percent of all search observed by Chitika originates from the Google search box in Firefox. As a user, I’m definitely in awe of Instant’s speed, but I don’t see myself changing my toolbar searching habits to load up Google.com. Instant should be woven into the software platforms and operating systems where we access the Internet today and in the future — rather than those of the the past. When Google launches Instant on mobile and in the browser we’ll get a better idea of its potential impact. And with their touch interface, lack of keyboard, and orientation towards content consumption, tablets are where Instant could really shine. interesting thought. Not sure I agree with every aspect, but generally you describe some interesting trends, in particular the importance of the toolbar-traffic. I fail to see how the Instant UI would work on mobile. Half of the screen of the browser is taken by the keyboard. Besides the input field, that leaves you five lines of text. Good enough for suggest-list, not enough to display anything more -like the dynamic set of results instant delivers to the desktop. Now Google already includes Suggest in their mobile search page. Latency over mobile networks handicaps the user experience to the point of “nice idea but to slow for me”. Now mobile latency – in my understanding – is inherent to mobile networks and beyond Google’s influence. So, Instant – as an enhanced version of Suggest – will work over Wifi, not really over 3G. Probably LTE will change things, but that will take years to reach a broad base of subscribers. Good points. I’ll say one thing for Google Instant, it makes lots of people I’ve talked to think about LTE. Great article. The key to driving up revenue is performance and personalization that comes from device, user and location context. We recognized this several years ago and now have a version of Google’s Android browser which adds these missing features and more. For instance one thing that is critical to monetizing the web is accurately determining HTTP web traffic performance in the Mobile browser. Our version of the Android browser now includes that capability. And in tests you can clearly see one of Google’s own servers not performing up to snuff. Let me know if you would like the link to see the screenshots. Thanks for the link! There is a difference between search sessions and actual searches, which I suspect is why the number I had was different. No doubt it’s a nice feature, but I think it’s a step in the direction of Google installing keyloggers on all our devices. It’s coming in stages with keylogging and voice recognition. Tracking and returning each key you press to return those results. Google’s voice search app on Android keeps itself loaded into memory no matter how much you kill it. I don’t think it’s about search speed. I forget where I read it, but there was an article about Google Voice saying that it was a way to feed voice data into Google systems so that it could have a huge real use case sample to learn from. This seems like a learning machine idea. “The Google” is constantly giving advice/suggestions that the user can take by stopping his/her search or reject by continuing it. It’s a computer butler that learns in real time. 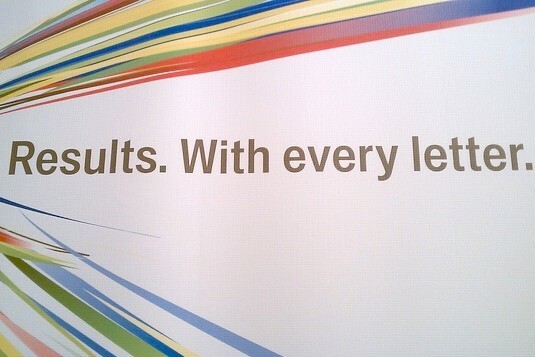 I think it’s less about speed and more about moving Google from a Search Engine to a Suggestion Engine. (how much) Does anyone miss letter-by-letter search? Yes, on a mobile, your typing speed _was_ not the same as on a PC. A speed improvement in any aspect of life is always welcome, but Instant seems to be solving a problem relevant in the T9 days as against the swype days. With apps like swype, you type faster on your mobile than on a PC! Given this, do we really need instant? Google Instant is Desktop Search with training wheels. Future Search innovation will remove the need to type anything. Keyword locator tab applications will take over. I noticed the change today on Google and thought maybe I had accidentally enabled one of their “lab” features. I am loving the new instant search… I find it really useful. Mobile with instant search will be interesting. I’m not really sure there is a big need for it! Don’t most already have recommendations? this is part of a bigger trend – now that there are tens of millions of users getting used to smartphone interfaces and UIs, the user-experience offered by mobile screens will make its way to all websites/web-apps. it is economical, respects User’s time, and is responsive. wasn;t there an ex Apple software engineer starting a company to deliver websites that behave/look like (iPhone) Apps? I tried searching for it on gigaom.com but couldnt find the link. the story ran a few months back. This looks cool, but I’m way too lazy to go to the home page when I can enter my search right in the handy Chrome box for search and URLs. Is the “toolbar” functionality including Chrome, or is that a separate animal? The coming browser implementation wasn’t officially described or announced, just mentioned in response to a question about it.